Science is about understanding, reasoning and improving the natural world through systematic observation, experimentation, modelling and calculation. 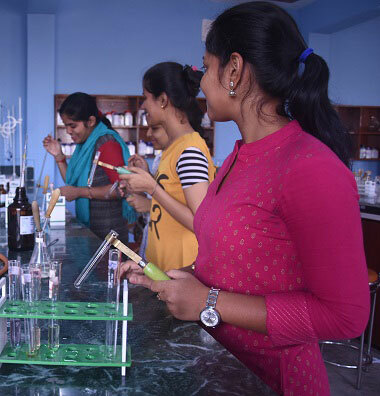 Studying pure and applied science at Midnapore City College can provide you with the opportunity to harness the skills and knowledge necessary to make a real contribution to the challenges facing the world today. Now-a-days, mathematics is essential in many fields, including natural science, engineering, medicine, finance and the social sciences. Applied mathematics has led to entirely new mathematical disciplines, such as statistics and game theory. Mathematicians also engage pure mathematics or mathematics for its own sake, without having any application in mind. Students of Mathematics under the Pure & Applied Science Department are very much meritorious, talented and hard working. They are disciplined and polite to the teachers. Students are curious to know the subject deeply. Their questioning mind helps them to develop the ideas of mathematics. At the end of their courses most of them are given special care under the observance of the faculty members to appear in the national level competitive exams like JAM, NET, SET etc. The students get the opportunity of attending seminars and invited lectures addressed by eminent mathematicians, faculty members from different Universities, professors from other institutes and speakers from other areas of interest. The students of this department themselves arrange some presentation classes to deliver lectures on their chosen topics. It helps them to understand topic clearly. The subject, Physics under the department of Pure & Applied Science in Midnapore City College, affiliated to Vidyasagar University was established in February, 2017 with an ambition to pursue high level teaching methodologies and top-notch research in advanced areas of experimental and theoretical physics and interdisciplinary areas of science and technology. The department starts out its journey to teach Under Graduate physics as well as Post Graduate physics with sincere and experienced faculty. The department has well equipped teaching laboratories including modern experimental set ups for achieving high standards in learning. The curriculum is framed in such a way that students are able to achieve sound theoretical foundation and problem solving skills and exposure. A range of research areas is provided through choice elective courses. M.Sc. students are given hands on training in all aspects of the subject being taught from computation to sophisticated experiments. We encourage our students to present their work in conferences and to publish their work in journals. We do give much emphasis to presentation skills and train students to appear for National Level Exams like GATE and NET. Our PG programme is running with renowned professors as well as famous guest teachers who come from different colleges to share their huge knowledge with the students. Welcome to the Chemistry Subject under Pure & Applied Science Department at the Midnapore City College. 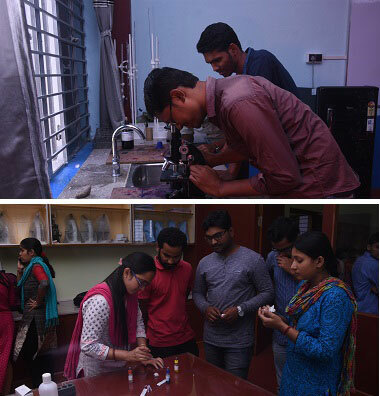 Chemistry is one of the premier science departments of the College with a dedicated and dynamic group of teachers who are not only keen in imparting quality education to the students but are also actively engaged in research with subsequent publications in reputed scientific journals. The faculty members are eager to encourage the students for taking up research as their career and over the past ten years a large group of students, after graduating from the college, have studied in IIT/ IISc/ IISER and are now in research both in India and abroad. The faculty members are also actively involved in research and are publishing quality papers in reputed scientific journals quite regularly, using the instrumental facilities in the Central Research Unit developed by Midnapore City College. The Department has taken a big leap forward to introduce as a part of its curricular activity 'Instrumental Method of Analysis' and 'Computer Programming with application in Chemistry' in order that the UG students can make use of the instrumental facilities at the Central Research Unit and the computation facilities of the college. In an effort to motivate the students and expose them to contemporary research, the department organizes a National level Symposium every year, where renowned scientists from different parts of India participate and deliver scientific lectures. In addition, 'beyond curricular' classrooms lectures are also organized and the students get an opportunity to interact with the eminent scientists. "GIS is waking up the world to the power of geography, this science of integration, and has the framework for creating a better future"
The Geography under Pure & Applied Science Department of Midnapore City College was established in 2007. It was started with a B.Sc. & M.Sc. Degree courses with a sanctioned strength of 60 each (UG & PG) students by understanding the current nature of Geography and the importance of the subject in scientifically analyzing the spatial patterns of various phenomena, the University has changed the subject from the Faculty of Arts to the Faculty of Science in 2017.Now the department is a full fledged with 4 faculty members who have specialized in various branches of geography. The Department now offers B.Sc. and M.Sc. courses in Geography. The B.Sc. and M.Sc. syllabus of this department are on par with the UGC syllabus and offers moderns tools and techniques. The department has a well-equipped Cartography and GIS (Geographic Information System) Laboratory. This includes Survey of India. There are number of survey equipment like chain, plane table, dumpy levels, clinometers, prismatic compasses etc. The GIS lab has 10 PCs with latest configurations with peripherals like laser printers, scanners and an internet connection. The Department acquired modern tools like Digital Plan meter, Mirror Stereoscopes, Digital Handycam, Hand held GPS receivers, Digital Satellite data of IRS 1A, IRS 1B, IRS 1C, IRS 1D and LANDSAT satellites. The GIS and Digital Image Processing software procured by the department include INTERGRAPH and ERDAS IMAGINE in addition to free and open source software like QGIS. The students are trained to use these instruments and software as part of their curriculum. Department recently procured a laptop computer and a LCD projector which are effectively used for class room teaching.